In 1910, the French engineer Leon Gaumant demonstrated his sound-and-film synchronizing Chronophone system at the Gaumant Palace—a 5,500 seat reconstruction of the Hippodrome, which was at the time Europe's largest movie theatre—in Paris, FR. At the time, moving pictures with synchronized sound were limited in length by the playing time of a gramophone records—the longest was 200ft, at 16 frames-per-second. Gaument's Chronophone had two gramophone platters, between which a deft operator could switch back and forth—a clever solution! 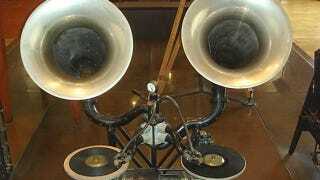 Note the twin gramophones, driven from a common electric motor between them. An air hose goes to each valvebox from the control valve just under the air pressure gauge...this control valve allowed the operator to crossfade between the two gramophones. Compressed air enters the valvebox through the central pipe, and exits through the two pipes at each side. Note the diagonal wire and spring to reduced the otherwise enormous downward tracking force.